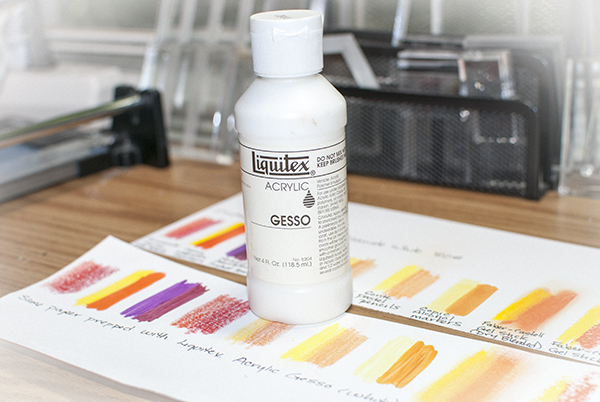 So What Is Gesso Anyway? This afternoon, I did another experiment using the Strathmore Premium Cover white cardstock I purchased a few weeks ago, this time looking at how prepping it first with gesso changes the way a variety of art mediums behave on it. All of the art mediums I tested are commonly used by stampers: regular colored pencils, watercolor pencils, watercolor markers, archival pigment markers, watercolor crayons, pastel pencils, alcohol ink markers and Gel-Sticks/Gelatos. My inspiration to play with this traces back to my most recent “Gelatos, Gel-Sticks & Stamps” eArticle. In researching the topic, I learned that you can improve dry blending of Gel-Sticks or Gelatos if you first prep the surface with a light coat of gesso. After I purchased the Strathmore Premium Cover but wasn’t happy with the way it takes colored pencils, I wondered if some gesso might make a difference. So today I gave it a try. Continue reading So What Is Gesso Anyway? This is the YouTube video that inspired my current “Doodling, Hand Lettering & Stamps” eArticle. It was created by Rachel Bland who was kind enough to give me permission to include a small screenshot of her video in the eArticle and included permissions on YouTube for embedding so I can share it here as well. I found it to be really inspiring. I’ve been using more doodling and hand lettering in my cards ever since I saw this. See what you think!